Reforming the EU’s rules is particularly important at the present juncture – governments must take advantage of the current environment to prepare for the next crisis. This column, part of the Vox debate on euro area reform, outlines the European Fiscal Board’s proposals for a major overhaul of the EU fiscal framework, which it argues would result in a simpler and more transparent framework thanks to the use of a single budgetary anchor and a single observable operational target. While today the need for fiscal rules is higher than ever, it is increasingly recognised that the Stability and Growth Pact (SGP) is not up to its task and requires a deep overhaul. In 2016, the Dutch presidency of the Council first stressed the need to simplify the rules and strengthen their medium-term orientation (Dutch Council Presidency 2016). In May 2017, the European Commission also called for a review of EU fiscal rules as part of the overall process of completing the EMU (European Commission 2017). The European Fiscal Board published its proposal for reforming the SGP in the 2018 Annual Report (European Fiscal Board 2018). Recommendations from international institutions (IMF, OECD) and the lively VoxEU debate on euro reform suggest that some convergence of opinion is beginning to emerge, both on the need for reform and on the main direction this reform should take (e.g. Bénassy‐Quéré et al. 2018,Conseil d’Analyse Économique 2018, German Council of Economic Experts 2018, Heinemann 2018). Reforming the rules is particularly important at the present juncture – governments must take advantage of the current environment to prepare for the next crisis. Further, it is important to recall that EU fiscal rules are part of a broader set of policy tools. For instance, the precautionary credit lines of the ESM require compliance with the SGP as one of the eligibility criteria.1 The same is true for the European Investment Stabilisation Function (EISF) recently proposed by the European Commission as part of the new multiannual financial framework (European Commission 2018a). A simpler, more transparent and more predictable framework is thus an essential component of the whole process of EMU deepening. What have we learned from the SGP so far? Today, the SGP features five main building blocks. First, two ‘anchors’ guide fiscal policy over the medium term: the budget deficit and the debt ratio. Second, these anchors imply overlapping fiscal requirements that occasionally offer conflicting signals: a structural adjustment and a target for debt reduction. Third, policies are monitored using a multitude of indicators, which inevitably cause conflicting signals; the assessment of compliance is therefore a judgement-based approach that weighs the pros and cons of the different indicators. Fourth, a complicated system of flexibility arrangements allows member states to negotiate reductions in their fiscal requirements, for instance in exchange for structural reforms and certain types of public investment. Finally, there is an escalating system of warnings and sanctions for non-compliance, although the latter have never been used (European Commission 2018b). This framework is the result of several reforms throughout the years, which gradually increased the complexity of the rules. Of some concern is the fact that the reforms added pro-cyclical features. 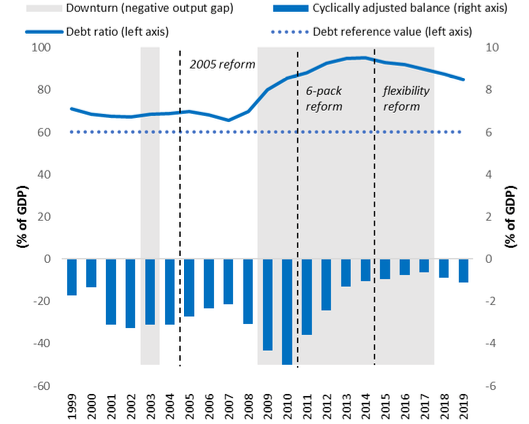 First elements of flexibility and cyclical corrections were introduced in 2005, when the euro area economy was in good shape, but the framework was substantially tightened during the crisis with the six-pack and two-pack reforms. As the economy began to recover again in 2015, further elements of flexibility were introduced, leading to a relaxation of the fiscal targets. This back-and-forth in the rules mirrors the underlying pro-cyclicality of fiscal policies in the euro area (see Figure 1) and highlights the difficulty of enforcing a supra-national fiscal framework. Ultimately, the SGP is the result of a political compromise among member states; perhaps for this reason it is time-inconsistent – ex-post the rules are relaxed to accommodate difficult cases. A renewed fiscal framework needs to go beyond compromise to reach a shared understanding of what constitutes good governance and to ensure ownership and democratic support for the rules. More concretely, several problems need to be addressed. First, today the rules are too complex and this has hampered their effectiveness; indeed, there is a common perception that the rules are applied unevenly, even when they are not. Second, the transparency of the framework has decreased. The use of multiple indicators, some of which unobservable, has increased the scope for discretion and judgement. Third, the separation that once existed between the Commission and the Council – the former in charge of legal and economic analysis and the latter in charge of policy decisions – has become less clear cut, as the Commission has been given more enforcement powers. In particular, the introduction of reverse qualified majority voting for the imposition of sanctions has de facto given the Commission important responsibilities for policy outcomes. Fourth, the enforcement of the rules through sanctions has not worked so far. While imposing sanctions on Member States may feed political and public resentments, a fiscal framework without any correction mechanism is not credible. In its 2018 annual report, the European Fiscal Board proposes a major overhaul of the EU fiscal framework. The proposed new framework relies on a single fiscal anchor: the 60% reference value for the debt ratio. This is directly translated into a single operational target: a constant ceiling on the growth rate of primary nominal expenditure net of discretionary revenue measures, ensuring that the debt ratio would reach 60% in, say, 15 years if the economy were at its potential and inflation at 2%. The expenditure ceiling thus includes a built-in debt brake. The ceiling is fixed for a three-year period to ensure a medium-term orientation of fiscal policies; at the end of the three years, it is recalculated based on what is needed to reach the 60% reference value 15 years ahead. The debt reference value is therefore reached asymptotically. This reform can be implemented by changes in secondary legislation, not the Treaty itself. The 3% Treaty reference value for the budget deficit therefore remains, but it is no longer used to set fiscal targets. While a member state could still face an excessive deficit procedure, this would require deviation from the expenditure rule outlined above. The only difference between the preventive and the corrective arms of the SGP consists in stronger enforcement, but not in more stringent fiscal targets. Finally, the expenditure rule will not apply to member states with debt below 60% of GDP; in this case, the 3% deficit ceiling remains the only constraint. Compliance with the rule is assessed on the basis of a single indicator of net primary expenditure growth. In line with the current methodology used in the expenditure benchmark of the SGP, the impact of cyclical unemployment benefits is excluded, together with EU-funded investments. At the same time, gross fixed capital formation is smoothed over four years to avoid penalising public investments. Under the preventive arm, deviations from fiscal targets are recorded in a compensation account and need to be corrected in later years. A breach of the rules will occur whenever the cumulative deviation in the compensation account exceeds, say, 1% of GDP. Under the excessive deficit procedure, any deviation above the net expenditure ceiling will be considered a breach and may lead to sanctions. A general escape clause should replace the complex system of waivers and flexibilities currently embedded in the rules. This escape clause will allow member states to deviate from the expenditure ceiling under a limited set of exceptional circumstances, such as during a severe economic downturn or following highly unusual events outside the control of the government, such as natural disasters. Sanctions for non-compliance will apply equally in the preventive and the corrective arm. A revamped sanction framework could involve removing the discretion that exists when setting fines under the SGP. Additionally, the economic conditionality currently foreseen for European Structural and Investment (ESI) funds could be extended to the whole EU budget. Finally, positive conditionality should be introduced, for instance, adherence to the rule could allow access to the recently proposed European Investment Stabilisation Function, or any other future central fiscal capacity. Figure 2 presents a stylised representation of the proposed framework. Source: European Fiscal Board Annual Report 2018. The Board finally proposes to reform the overall governance of the rules by assigning a greater role to independent institutions in assessing compliance, particularly in relation to the use of the escape clause. This would strengthen the framework by providing a greater separation between the ‘assessor’ and the ‘decision maker’. Concretely, whenever a breach of the expenditure rule is observed, it will be up to an independent assessor to conduct an evaluation of whether the escape clause can be triggered. Such assessor could for instance be an EU-level independent fiscal institution (IFI), possibly in combination with national IFIs. The European Commission and the Council will then take the ultimate policy decision based on this independent assessment and, in case they decide to deviate from it, they will explain the reasons for such deviation. The implementation of the full reform package will result in a simpler and more transparent framework thanks to the use of a single budgetary anchor and a single observable operational target. Enforcement will also be more effective, because a stronger system of sanctions – which applies also under the preventive arm – and a limited use of escape clauses are backed up by the need to comply or explain by the decision makers. Moreover, the three-year interval for recalculating the expenditure ceiling enhances the medium-term orientation of the budget. 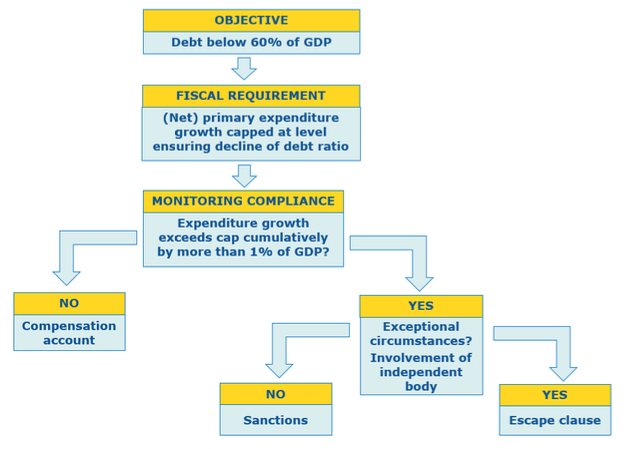 Figure 3 presents a simulation of the expenditure rule for several euro area countries, and compares it to the current debt rule embedded in the SGP. The expenditure rule seems to strike an appropriate balance between debt sustainability and economic stabilisation. It helps to stabilise the economy, because the expenditure ceiling is calculated assuming that growth is at its potential and that inflation is at 2%; during a downturn, spending is allowed to grow at a higher rate than the economy, and vice versa. For example, in Italy and Spain nominal growth is still below its potential, leading in the short run to higher net expenditure growth than under the current debt rule, which is based on eliminating one-twentieth of the gap between the actual debt-to-GDP ratio and 60%. Our rule implies that these countries are initially required to run only relatively low primary surpluses, and fiscal targets will become more demanding only when growth and inflation return to normal. By stabilising net expenditure growth, the rule allows for a steady improvement in the primary balance, as public debt gradually converges towards 60%. The need to bridge the sizeable gap with the 60% debt anchor in 15 years’ time requires Italy in particular to run substantial primary surpluses. This confronts the country with an arduous task. However, the severity of this task is mitigated by the fact that the required increase in primary surpluses is lower in countries in which the economy is growing below its potential. Over time, as the debt ratio keeps falling, the rule allows for increasingly higher rates of net expenditure growth while still maintaining adequate primary surpluses. Notes: The adjustment path under the expenditure rule is computed every three years, assuming that the economy is growing at its potential rate and that inflation is at 2%, so as to bridge the gap to 60% debt-to-GDP in 15 years. Implicit interest rates are computed assuming that long-term nominal rates converge to 5% over ten years, and interest expenditures increase in line with the expected roll-over schedule of debt. 'Net expenditure growth' refers to the growth rate of primary expenditures at current prices, net of discretionary revenue measures and cyclical unemployment benefits. The adjustment under the debt rule in the SGP is computed every year on the basis of the current macroeconomic outlook, so as to reduce the gap between the actual and the 60% debt-to-GDP ratio by one-twentieth. In both the current SGP and under the proposed debt rule, the adjustment is hence asymptotic. Under the current SGP, the short-run adjustment requirement is tempered by gradual adjustment of the structural balance to a medium-term objective, while under the expenditure rule, gradual adjustment occurs automatically by setting the growth rate of expenditures, rather than a structural balance target, and by allowing faster growth in expenditures relative to revenues in economies that are growing below potential. Bénassy-Quéré,A, M Brunnermeier, H Enderlein, E Farhi, M Fratzscher, C Fuest, P-O Gourinchas, P Martin, J Pisani-Ferry, H Rey, I Schnabel, N Veron, B Weder di Mauro and J Zettelmeyer (2018), “Reconciling risk sharing with market discipline: A constructive approach to euro area reform”, CEPR Policy Insight No 91. Conseil d’Analyse Économique (2018), “European fiscal rules require a major overhaul”, Note no.47, September. Dutch Council Presidency (2016), “Improving predictability and transparency of the SGP”, Informal ECOFIN, 23 April. European Commission (2017), “Reflection paper on the deepening of the economic and monetary union”, 31 May. European Commission (2018a), “Proposal for a REGULATION OF THE EUROPEAN PARLIAMENT AND OF THE COUNCIL on the establishment of a European Investment Stabilisation Function”, COM/2018/387 final - 2018/0212 (COD). European Commission (2018b), “Vade Mecum on the Stability & Growth Pact”, European Economy — Institutional Papers 075, March. German Council of Economic Experts (2018), “Refocusing the European fiscal framework”, presented at Bruegel, 12 September. Heinemann, F (2018), How could the Stability and Growth Pact be simplified?, Report written at the request of the European Parliament’s Committee on Economic and Monetary Affairs.